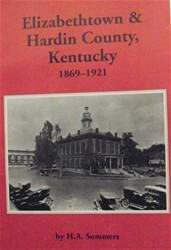 The Hardin County Historical Society is pleased to offer the publications below that document and tell the colorful stories of Hardin County’s history. Order forms and payments can be mailed to the society or turned into the Treasurer at any of the Society’s regular meetings. 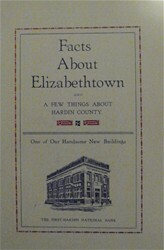 This hardback describes Elizabethtown's history in detail from 1779 to 1869 by tradition and the recollections of the author regarding Elizabethtown's prominent residents, structures, businesses and occurrences. 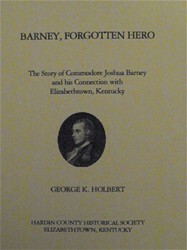 This pamphlet tells of the exploits of Revolutionary War and War of 1812 naval hero Joshua Barney and his connection with Elizabethtown, Kentucky. 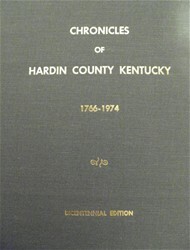 Dates and summarizes the important historical events that made Kentucky and Hardin County what it is today. This work examines Elizabethtown native Philip Arnold's life as a miner, his participation in the Great Diamond Fraud, his return to Elizabethtown, Kentucky and his legal problems. A school journal published by the sophomore and junior classes of East Side High School telling of life at the high school. Includes articles from the students, pictures of a few of them, and old advertisements of the time. This is a pictorial history in the Images of America series. It looks at various areas of the city, its people, and educational opportunities, stressing the development of these areas of the town from the late 1800's to about 1925. 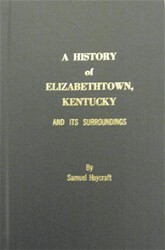 This book is the complement to Haycraft's and takes up where he left off describing the history of Elizabethtown from 1869 to 1921 in great detail. See who is living in Elizabethtown according to the telephone directory. 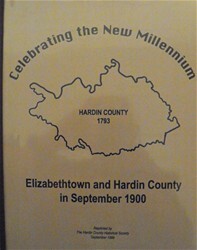 This pamphlet discusses the first 100 years of Elizabethtown's existence. 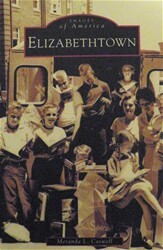 This paperback tells little odds-and-ends facts about Elizabethtown during the 1920 time period. 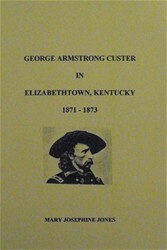 This pamphlet describes Custer's two years of residence in Elizabethtown. This is a pictorial history in the Images of America series. 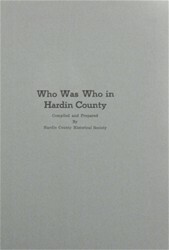 This is a work which discusses the various towns in Hardin County, their development and their people, primarily in the late 1800's and early 1900's. Many of the photographs come from the hitherto unpublished collection of the Brown-Pusey Library in Elizabethtown. 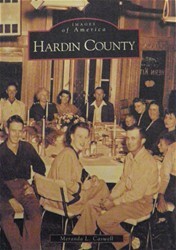 This paperback lists all of the Hardin Countians that fought in World War II and all of the volunteer services and Red Cross services that Hardin County provided during the war, and more. 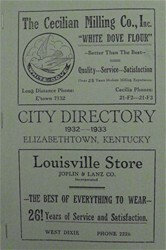 This paperback provides an inventory of the important architecture of Hardin County. This pamphlet details the 15th President of the United States James Buchanan's short stay when he lived in Elizabethtown, Kentucky. 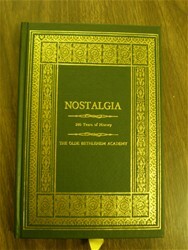 This book provides the history of the Bethlehem Academy, a Catholic girls' boarding school. 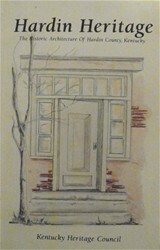 The book reflects on the Academy's operation, closing and subsequent restoration of the building. This is a brochure telling of the memorial in Sarah Lincoln's name that is in the town square and why it was erected also including a copy of the marriage license of Thomas Lincoln and Sarah Bush Johnston. This publication celebrates the new millennium in Hardin County with pictures, advertisements and articles from September 1900. This book tells of the Bond-Washington High school in Elizabethtown for African Americans, before the Civil Rights act, through the eyes of a former teacher. This pamphlet describes the incident between a temperance leader, Carrie Nation, and Elizabethtown saloon keeper, J.R. Neighbors and the aftermath. This book reflects on the War between the States and the impact on Hardin County from the election of Abraham Lincoln to Union occupation and Confederate Raids. This book provides an insight into the Lincolns' lives in Kentucky, including pictures of their home and the grave yard where some members of the family now rest. This paperback chronicles the life of the Thomas Lincoln as he moves his family from Kentucky to Indiana. This pamphlet describes in detail where the different members of the Lincoln family lived in Elizabethtown, how long they lived here, and what they did during the time they were here. This is a pictorial history in the Images of America series. 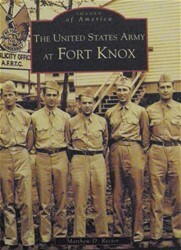 The work covers the beginning of Fort Knox and World War I and its aftermath in the period, 1903-1931; the history of the development of and armor build-up period, 1932-1940; World War II, 1941-1945, and post World War II, 1946-1958. This book presents the History of Elizabethtown and Hardin County through a series of short stories from the Native Americans and Pioneers to World War II and Elizabethtown Community College. 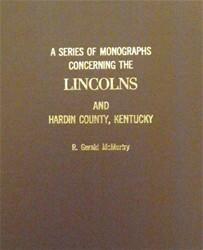 Compiled in 1946 by various members of the Hardin County Historical Society. 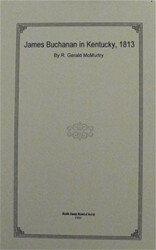 Reprint 2005, with corrections. 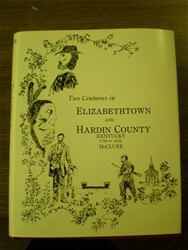 This book contains sketches of 177 early residents of Elizabethtown and Hardin County, ranging from the pioneer settlers of 1780 to prominent residents of the early 20th century.